For years there has been a controversy about how long it takes after the tick bite to pathogen transmission of Lyme disease. 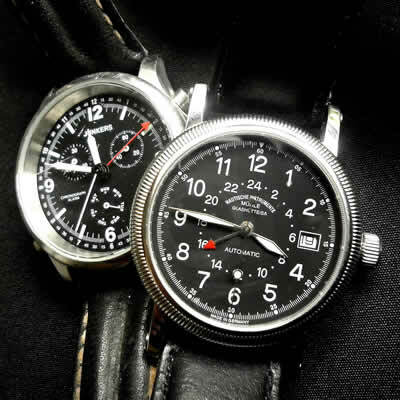 This time is shown by at least 12 to 24 hours suction period. 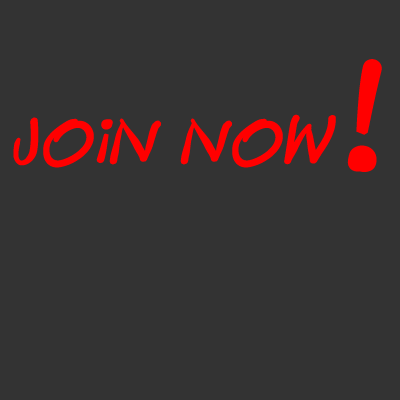 These data sources are given with very small collectives, the type of statistical analysis is not specified and few, if any, details are given. 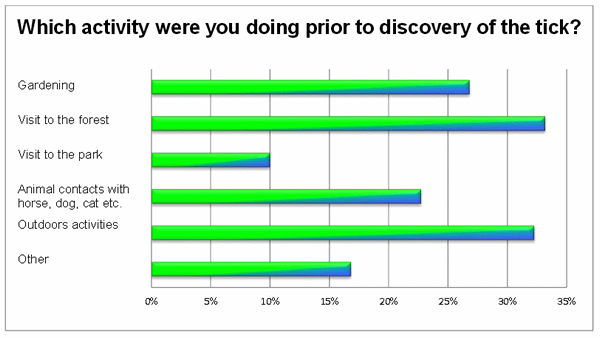 That is why we have adopted the theme and evaluated surveys with larger populations. 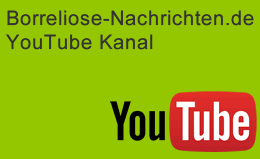 Today we present the results of the combined international survey. We analyzed a total of 220 international records, the suction times in this population are very significantly below the previously assumed values. 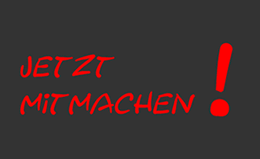 This is the first time we have presented the data collection „suction time“ on the website www.borreliose-nachrichten.de. We will regularly publish additional data received at this point. 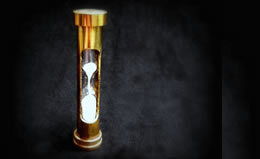 How long do you estimate the absorption time of the tick in hours? The median (middle value) is the value that is exactly in the middle of a data distribution. It divides the data into two halves. 50% of the data is less than or equal to the median, 50% are greater than or equal to the median. We have deliberately refrained from reading the 72 hours in our calculations, and we describe these as „outliers“, because we would then remove them from the record. We use the word outlier in the statistics when a measured value does not seem to fit in line with the other measurements. We assume that all subjects answered the questions to the best of their knowledge. 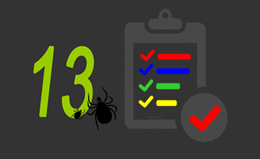 It is quite possible that the tick was discovered only three days after a forest walk and there have been no further stays outdoors, the respondent only discovered the tick after 72 hours (3 days). Great feature values have a strong upward effect on the arithmetic mean. The median however, is exactly in the middle of a data distribution and is robust against large feature values​​. We have maximum transparency in the statistical analysis. Therefore, all evaluable records were included. We explain this part of the statistic so precisely because having our understanding on par with our readers is important. We all reach safety in dealing with data only if we understand the content. In this summary, these results are likely to be presented to a scientific audience. 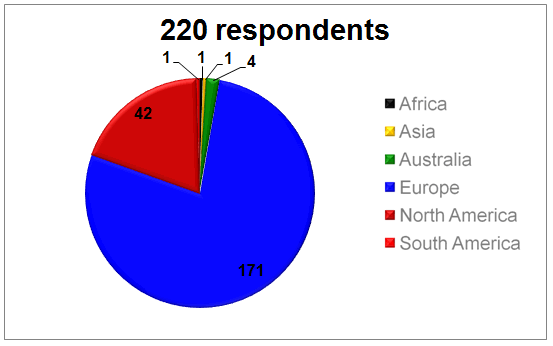 108 of the 220 respondents had an erythema migrans. 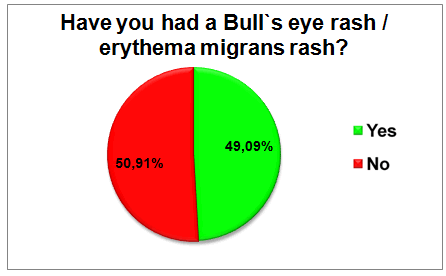 112 respondents didn’t have a Bull`s eye rash / erythema migrans rash. 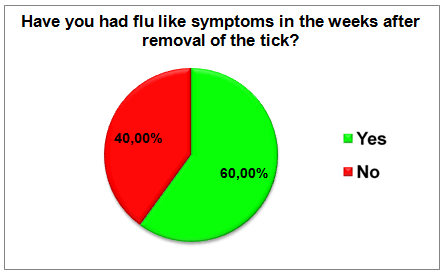 132 of the 220 respondents have had flu-like symptoms in temporal association after removal of the tick, 88 respondents didn’t have flu-like symptoms. 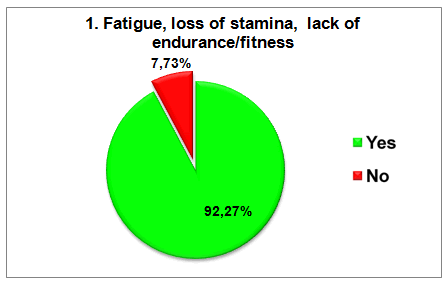 203 of 220 respondents noted fatigue, loss of stamina, lack of endurance/fitness, 17 of the respondents didn’t remember those symptoms. 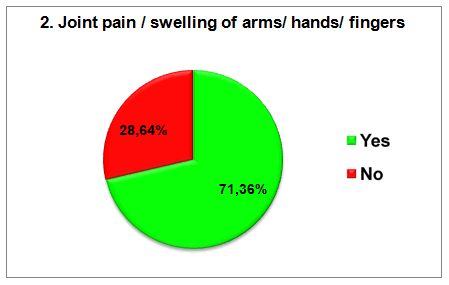 157 of 220 respondents noted joint pain / swelling of arms/ hands/ fingers. 63 of the respondents didn’t note these symptoms. 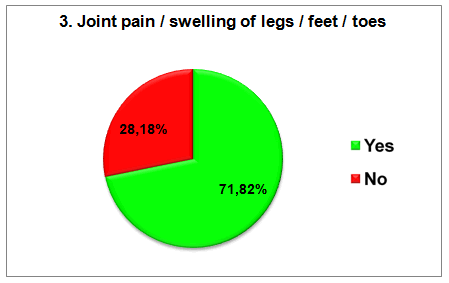 158 of 220 respondents noted joint pain / swelling of legs / feet / toes. 62 of the respondents didn’t note these symptoms. 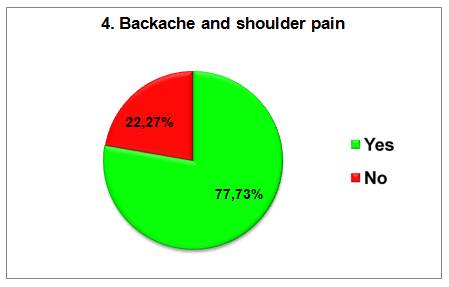 171 of 220 respondents had backache and shoulder pain. 49 of them didn’t have those symptoms. 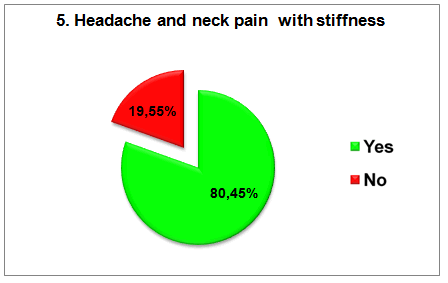 177 of 220 respondents had headache and neck pain with stiffness. 43 of them didn’t have these symptoms. 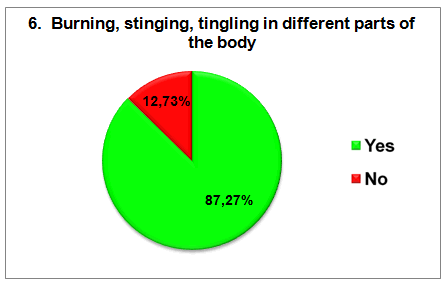 192 of 220 respondents had burning, stinging, tingling in different parts of the body. 28 of them didn’t have these symptoms. 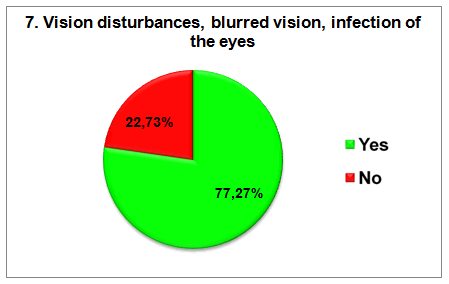 170 of 220 respondents had vision disturbances, blurred vision, infection of the eyes. 50 of them didn’t have these symptoms. 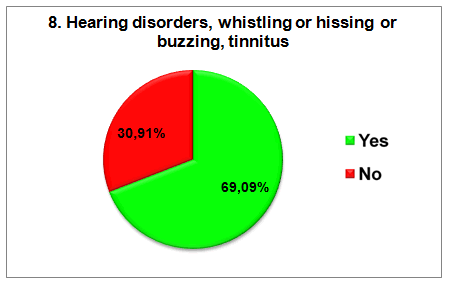 152 of 220 respondents noted hearing disorders, whistling or hissing or buzzing, tinnitus. 68 of this group didn’t remember those symptoms. 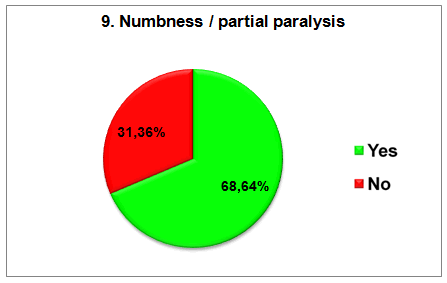 151 of 220 respondents noted numbness / partial paralysis, 69 respondents didn’t note those symptoms. 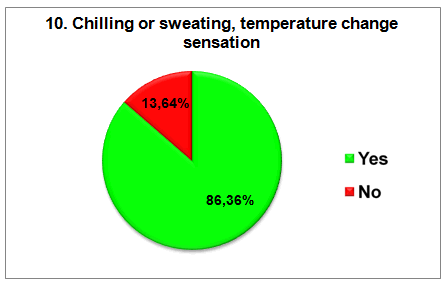 190 of the 220 respondents had chilling or sweating, temperature change sensation. 30 of them didn’t have these symptoms. 152 of 220 respondents had shaky gait, unsteady grip. 68 of them didn’t have these symptoms. 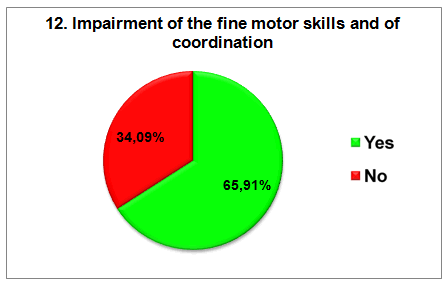 145 of the 220 respondents had impairment of the fine motor skills and of coordination. 75 of them didn’t have these symptoms. 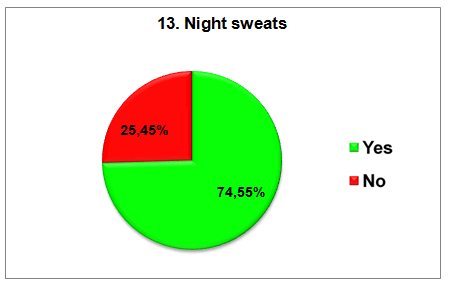 164 of 220 respondents had night sweats. 56 of them didn’t have this symptom. 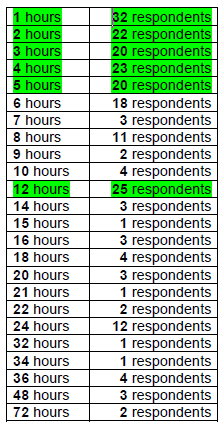 117 of 220 respondents had night-time urination. 103 of them didn’t have this symptom. 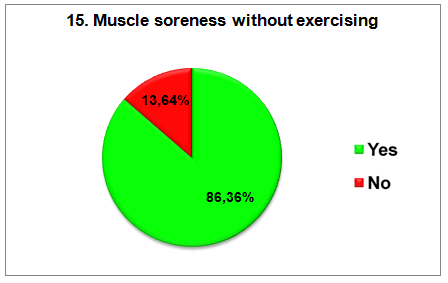 190 of 220 respondents had Muscle soreness without exercising. 30 of them didn’t have this symptom. 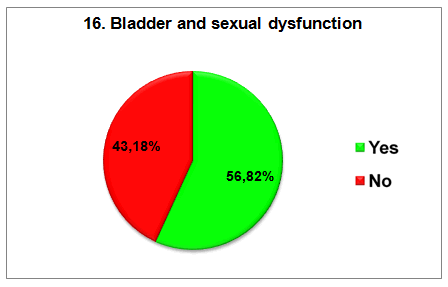 125 of 220 respondents had bladder and sexual dysfunction. 95 of them didn’t have these symptoms. 189 of 220 respondents had insomnia, sleeping problems (too much or too little). 31 of them didn’t have these symptoms. 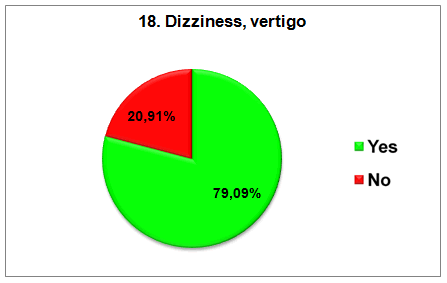 174 of 220 respondents had dizziness and vertigo. 46 of them didn’t have these symptoms. 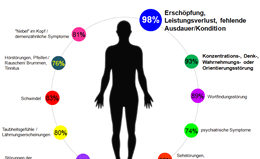 199 of 220 respondents had concentration, thought, perception or orientation disorder. 21 of them didn’t have these symptoms. 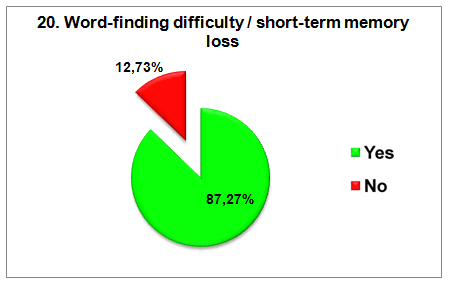 192 of 220 respondents had word-finding difficulty / short-term memory loss. 28 of them didn’t have these symptoms. 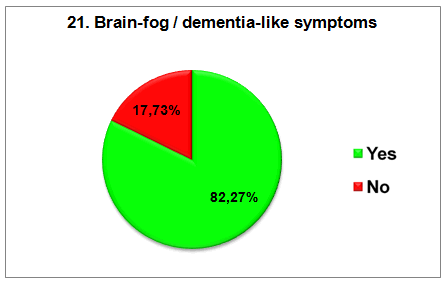 181 of 220 respondents had brain-fog / dementia-like symptoms. 39 of them didn’t have these symptoms. 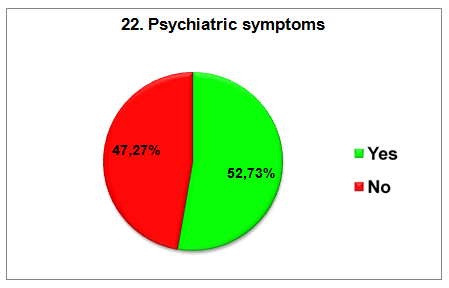 116 of 220 respondents had psychiatric symptoms. 104 of them didn’t have those symptoms. 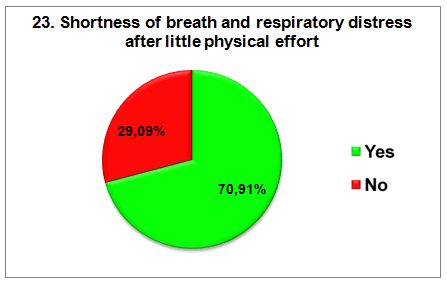 156 of 220 respondents had shortness of breath and respiratory distress after little physical effort. 64 of them didn’t have these symptoms. 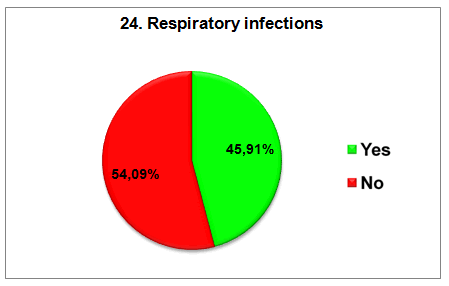 101 of 220 respondents had respiratory infections. 119 of them didn’t have these symptoms. 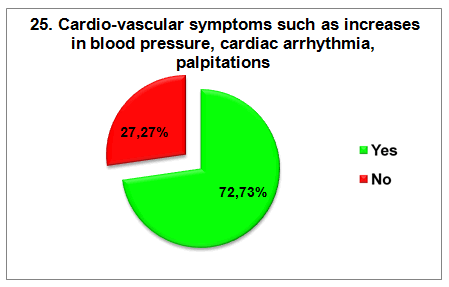 160 of 220 respondents had cardio-vascular symptoms such as increases in blood pressure, cardiac arrhythmia, palpitations. 60 of them didn’t have these symptoms. 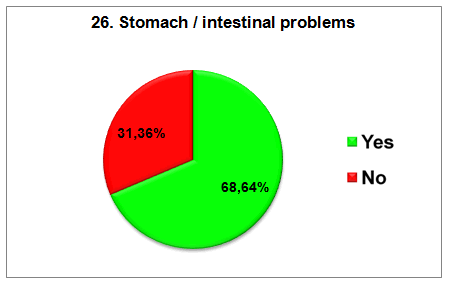 151 of 220 respondents had stomach / intestinal problems. 69 of them didn’t have these symptoms. 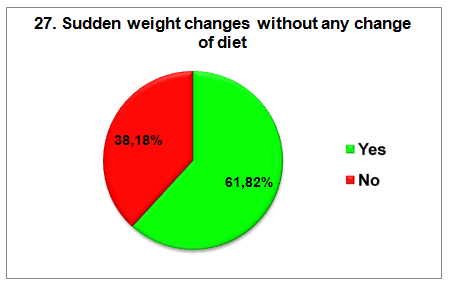 136 of 220 respondents had sudden weight changes without any change of diet. 84 of them didn’t have these symptoms. 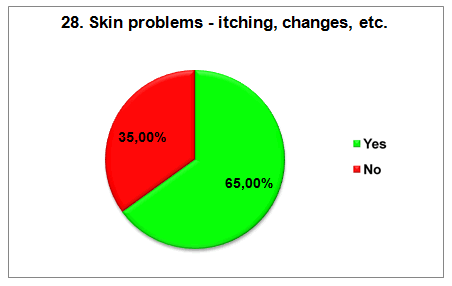 143 of 220 respondents had skin problems – itching, changes, etc. 77 of them didn’t have these symptoms. 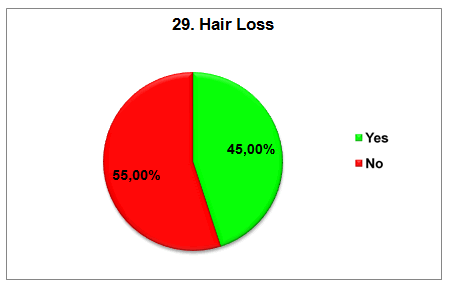 99 of 220 respondents had hair loss. 121 of them didn’t have this symptom. 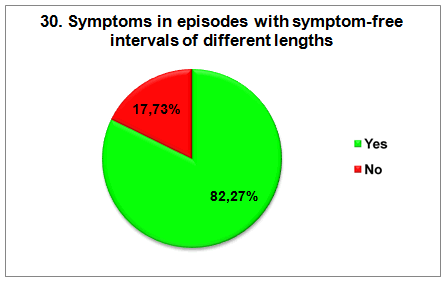 181 of 220 respondents had symptoms in episodes with symptom-free intervals of different lengths. 39 of them didn’t have these symptoms.